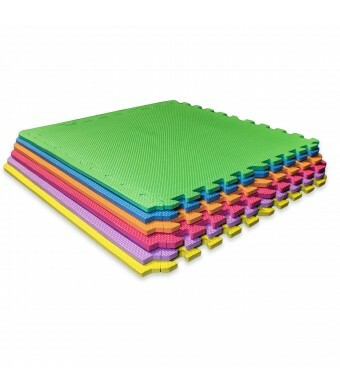 Sivan ® Interlocking Foam Floor Mat provides a cushion to hard floor surfaces in playrooms, classrooms, gyms, and more! These tiles are perfect for exercise, gymnastics, yoga, crossfit, Pilates, mma, children's play areas, daycares, workshops, fitness rooms, camping and poolside areas. Interlocking pieces can be mixed and matched to evolve with your needs and for added variety. Large, cushioned, and interlocking pieces are very safe; not only for exercise workouts but also to protect against damage to floors. These are also excellent play mats for children to keep kids entertained and interactive. They come in bright, assorted colors that can be rearranged to your preference. The puzzle pieces can even be used to build creative shapes and figures! This mat can be used to design empty space in homes, schools, gyms, and many more places. Add the border edges for a neater look. The mat is grooved on the top with a non-skid bottom for ultimate safety and protection. An awesome mat for hard floors and soft heads! It is made out of high density EVA foam for the greatest durability and comfort. EVA foam is durable, non-toxic, premium foam that is lightweight and easy to assemble. It is also water, mold and mildew resistant which makes it easy to clean. This mat is a great addition to any household! It is also safe for children of all ages. Puzzle floor mat has six multi-color square pieces - green, orange, yellow, purple, pink, and blue (each measures approximately 24x3/8x24) for a total of 24sq ft.